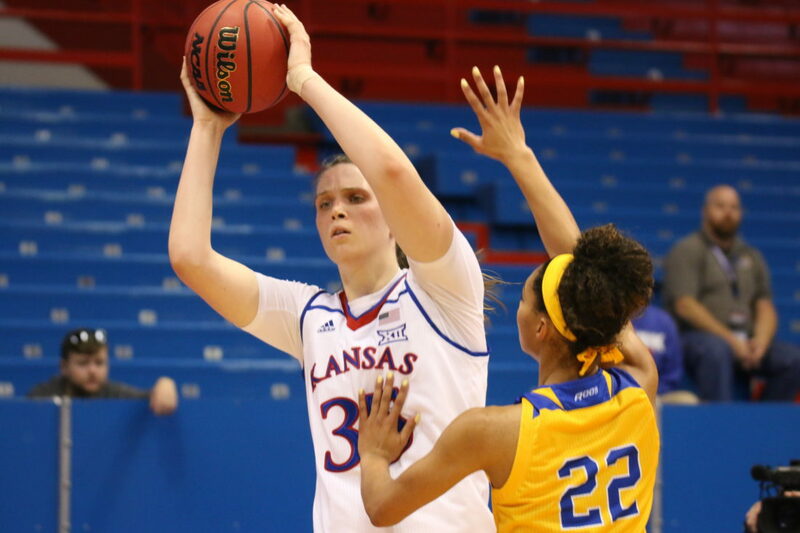 Sophomore center Bailey Helgren looks for a pass in a game against UMKC Wednesday night at Allen Fieldhouse. “The huge blocks,” Kopatich clarified to Helgren. While Helgren answered, she then looked at the stat sheet and couldn’t contain her excitement. “Oh, you had five blocks,” she said. “Really?” Helgren replied, even more shocked. “Dope!” Kopatich said as she stood up with a smile. Helgren immediately made an impact early in the game, starting at center and creating pressure to force a 15-5 run where Kansas (1-0) only missed one shot. By the end of the game, Helgren and senior Austin Richardson combined for 21 rebounds. 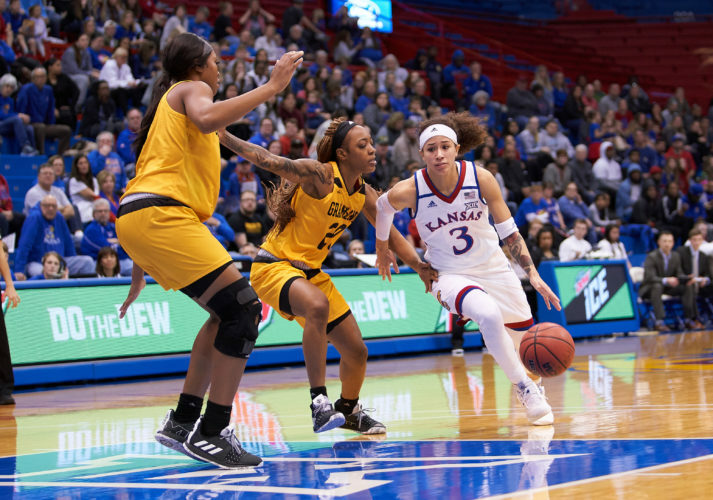 “It’s great to see positive things happen for (Bailey), because she’s a kid that’s worked really, really hard and really improved,” Kansas coach Brandon Schneider said. “She’s one person who I think we can rely on to hit shots at all three levels and get us going,” Helgren said. As time ticked off the clock, and more Jayhawks saw the court, the shots got sloppier and the hot start was stuck in the past. At one point both teams combined for 32 percent from the field. UMKC closed the deficit to nine in the fourth quarter with five minutes to play. Standing out in the first two exhibitions on offense, freshmen Anayia Thomas and Brooklyn Mitchell only played seven minutes. Thomas was the only one to score a basket on two shots, and Mitchell didn’t score on two 3-point attempts. Mitchell and Thomas turned the ball over five times, and didn’t tally a rebound, steal or assist. When asked of his decision to bench the duo after the game, Schneider was quick to share the reason behind his decision. Sixth-year senior Jessica Washington missed her 31st straight game since tearing her ACL ahead of the 2017 season. Washington wore a boot on the bench for the first exhibition with Fort Hays State, and has been in sweats for the teams past two appearances. Kansas plays host to Oral Roberts (1-0) at 7 p.m. Tuesday.